In 1922 the British author Vita Sackville-West was commissioned to write a story and inscribe it in her own hand into a beautifully bound, tooled leather book. The oddity of the book is it’s the size of a postage stamp, measuring 1½ inches by less than ½ an inch. It resides in the library of Queen Mary’s Dolls’ House in Windsor Castle, England. Queen Mary’s Dolls’ House, considered the most extraordinary dollhouse in the world, was the brainchild of Princess Marie Louise, a granddaughter of Queen Victoria. To boost the morale of the country after the First World War, and to showcase the work of the finest British craftsmen, she asked the world-famous architect Sir Edwin Lutyens to build a dolls’ house, which was to be a gift from the nation to Queen Mary (Queen Elizabeth II’s paternal grandmother). More than 1,500 of the finest British artists, craftsmen, and manufacturers of the early 20th century responded to the call to create furnishings fit for a king for the three-foot tall Edwardian mansion Lutyens designed. The miniature house is filled with thousands of finely crafted objects, nearly all on the same 1:12 scale as the house. Many of them are replicas of the furnishings in Windsor Castle, including the carpets, curtains, and wallpapers. Among the many marvels of this dolls’ house are a fully stocked wine cellar (sadly, most of the fine vintages have evaporated), electricity, running hot and cold water, working elevators, a miniature working sewing machine, and flushing lavatories. The fleet of six perfectly functioning motor cars in the garage include a 1923 Rolls Royce Silver Ghost (with tiny silver-topped flasks nested in the rear door), and all the linens are embroidered with King George’s monogram and crown. Princess Marie Louise contacted 700 notable artists of the day, asking them to donate drawings, watercolors, sketches, etchings, lino prints, and engravings in scale to the house, and she asked 171 prominent authors to contribute works to the dollhouse library. Among the participating authors were J. M. Barrie, John Buchan, G. K. Chesterton, Joseph Conrad, John Galsworthy, Robert Graves, Thomas Hardy, Aldous Huxley, Rudyard Kipling, Somerset Maugham, and Edith Wharton. Sir Arthur Conan Doyle contributed the short story How Watson Learned the Trick, the ghost-story writer M. R. James wrote The Haunted Dolls’ House, A.A. Milne inscribed his poem “Vespers” into one of the wee volumes, and Vita Sackville-West wrote A Note of Explanation. For the past 96 years, only a few people have had access to read Sackville-West’s dollhouse book. At last it has been published as an illustrated book scaled for humans so readers can enjoy Sackville-West’s whimsical tale of the time-traveling sprite who takes up residence in the famous dollhouse. Sackville-West’s lively, inquisitive sprite was the one, “who encouraged Jack to set his foot upon the first rung of the Beanstalk . . . and waved Cinderella off to her ball . . .” Among her most treasured possessions, “worn as a locket, was the pea which had given the Princess such a sleepless night.” She saw Prince Charming kiss the Sleeping Beauty, and even witnessed the death of Bluebeard’s first wife (not a pleasant memory). Throughout her forays into fairy tale history, our sprite always is impeccably dressed in the garb of the time and place she occupies. She enjoyed wearing the becoming yashmak when she visited the harem to hear Scheherazade’s stories (she found Scheherazade to be, “long-winded and a bore,”), and when she visited the Emperor of China to hear the much-talked about nightingale, she donned the embroidered silks of the Chinese ladies. In 1922, she takes up residence in the newly built Queen Mary’s Dolls’ House. With her hair bobbed and dressed chicly in the flapper mode of the day, she enjoys sampling the wine from the cellars, taking hot baths in the commodious bathtubs, and sleeping in the elegant canopy beds which are equipped with warming pans and made up with the finest embroidered linens. Her activities do not go unnoticed by the dollhouse curators. Each morning when they take off the front of the house to reveal the inside, they are baffled to find lights turned on, unmade beds, raised blinds they had lowered, the elevator on a different floor from where they left it the night before, books removed from the library shelves, and dirty dishes on the dining room table. Illustrator Kate Baylay depicts our elegant, unruffled sprite holding a glass of champagne while she stands just out of view next to the window curtains, while a huge human looks through the window into the house, hoping to work out the mystery. 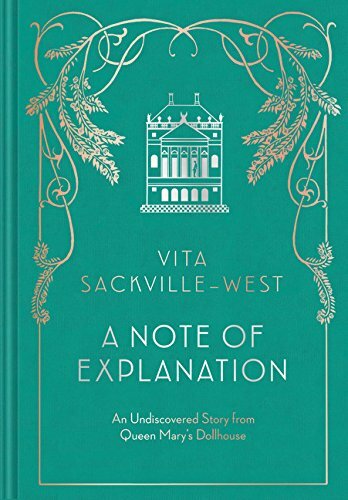 Sackville-West concludes by suggesting that the mystery can be solved simply by straining one’s eyes to read her tiny book that provides A Note of Explanation for the strange goings-on. Like its miniature version, the human-sized A Note of Explanation is beautifully produced. Instead of leather, it has a silver and copper embossed, cloth-bound cover, and the story is printed on high-quality paper. Kate Baylay’s Art Deco-style illustrations perfectly capture the elegance of the house and its occupant as well as the droll wit and whimsy of Sackville-West’s story that slyly references the dollhouse where it resides.